The Upper Cambrian faunas of Norway. 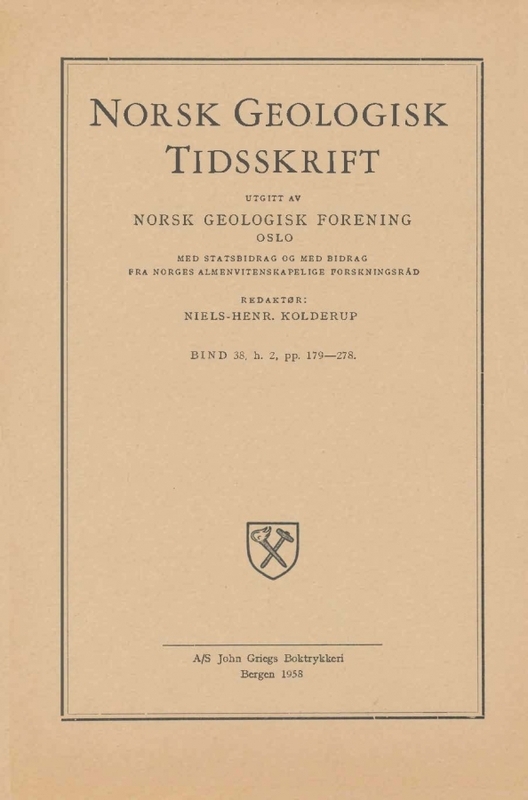 With descriptions of non-olenid invertebrata fossils. The Upper Cambrian fossils in Norway occur in the Olenid Series, a sequence of black bituminous shales (alum shales) with concretions and an occasional layer of black bituminous limestone (stinkstone). The shales crop out in various districts of the Oslo region and in the belt of larger Caledonian overthrusts in southern Norway. The alum shales were easily affected by tectonic disturbances and for this reason it is hard to give the exact thickness of the Olenid Series. It is probably no more than 60 m thick in the districts of the Oslo region where it is most completely developed. The Olenid Series in Norway is divided into 6 zones. The upper 5 of these embrace 29 subzones, whereas the lowermost zone is undivided and also is the only unit not based on an olenid. The olenids are by far the most common fossils in this series as a whole, although where they occur, Agnostus pisiformis, A. obesus, and Grusia lenticularis may be as numerous as any of the olenid species, whereas other fossils are rare. In addition to invertebrate fossils, some algae-like structures have also been found. The present paper includes descriptions of the few non-olenid trilobites and non-arthropod invertebrates known from the Olenid Series in Norway. For descriptions of the olenids, and for details on the Olenid Series, the reader is referred to an earlier paper (Henningsmoen, 1957b). In that paper, there is, furthermore, a discussion on the correlation of the Upper Cambrian successions in the AcadoBaltic and North American provinces. In this connection the writer would like to point out that a trilobite, described by him (1957a) as Taenicephalus? peregrinus from the Olenus zone in Sweden apparently belongs to the genus Pedinocephalus Ivshin 1956. This genus was described from an Aphelaspis fauna in Kazakhstan, which supports the view that the Olenus zone (or a part of it) may more or less be a correlative of the Aphelaspis zone.